Welcome to the UT History Blog, a place to explore the history and traditions of the University of Texas. This has been a longstanding interest of mine – “a hobby that got out of control” – and I enjoy sharing what I’ve discovered. As this site develops, you’ll find links to other articles about the University’s history, and what I hope will be a helpful guide for those who want to do some research of their own. Questions, comments and suggestions are all welcome. As a disclaimer, please note that this is not an “official” publication of the University of Texas. The writings and opinions are my own. Photo above: “Old Main” in spring. 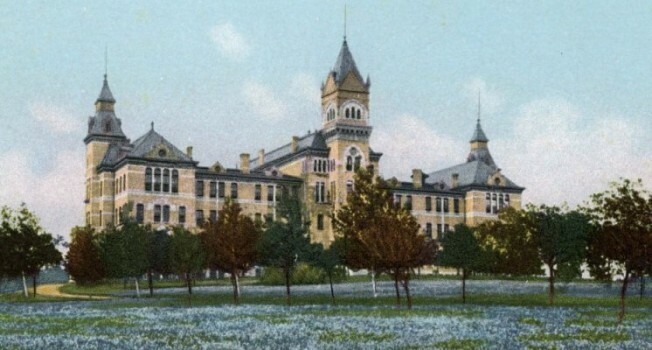 The Victorian Gothic old Main Building was the first on the campus, and stood where the current Main Building and Tower are today. And yes, the campus was a sea of bluebonnets in the spring.